Police have found no evidence to support allegations that an elderly WWII Leningrad Blockade survivor in St. Petersburg, Russia, shoplifted three packs of butter. The woman died of a suspected heart attack in a police station. 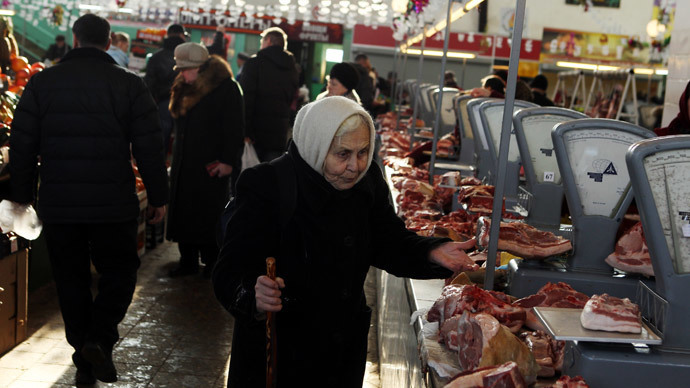 On Tuesday, 81-year-old Rauza Galimova, a resident of St. Petersburg, was paying for her groceries in an outlet belonging to Russia’s biggest grocery chain Magnit. According to eyewitness reports in the local media, she had already purchased most of her goods when the cashiers asked security to check the lady’s bag in front of a long line. According to the police, three packs of butter with a total value of no more than 300 rubles, or $4, were found in the bag. Theft of items up to the value of 1,000 rubles is not considered a criminal offense under the Russian law, but is usually punished with a fine several times greater than the cost of stolen goods. The police were called and Galimova, who had history of heart disease and reportedly struggled to walk up the stairs to her flat, was escorted to the local station. “As soon as she arrived in the lobby, she began to complain about feeling unwell,” said a statement from the St. Petersburg police. Galimova then crumpled on the floor, her lips turning blue. By the time the doctors arrived, she was dead. Prosecutors have thoroughly studied footage from the cameras installed at the supermarket. CCTV video showed that 81-year-old Rauza Galimova had immediately agreed to pay for the butter when she was accused of stealing. "As things stand now there are no grounds to claim that she stole that butter," attorney for the city Marina Nikolaeva was quoted as saying. "They did not take the money, however, and immediately called police," Nikolaeva said, referring to the store’s employees. Galimova's nephew Vladimir Sokolov said that officers later found 1,500 rubles ($22) in her purse. She received a state pension of 25,000 rubles ($370) a month, lived in a well-kept flat, and was financially supported by her relatives. “She wasn’t a woman on a downward slope, or on the margins of society – by any stretch of imagination,” said Emma Leshina, the head of a local organization that looks after survivors of the deadly Leningrad siege, which locked down the city between 1941 and 1944. Reports said Galimova had experienced two heart attacks and may have suffered from dementia. “When we visited her for her 80th birthday, we noticed that she was not responding appropriately to questions, and did not exhibit alertness. But alternatively, we had a commemoration of the end of the siege just last week, and maybe psychologically she was replaying those times of hunger, and that prompted her to behave in what was for her, an atypical way,” said Leshina. More than 1 million civilians are thought to have perished during the 900-day Siege of Leningrad by the Nazis. With food supplies running low almost from the start, and airlifts providing only intermittent relief, starving people inside Russia’s cultural capital had to resort to eating pets, pigeons and corpses of the dead. Those who managed to survive have been accorded a status in Russian society somewhat similar to Holocaust survivors in Israel. Galimova’s death has provoked a wave of fury on social media. Prominent actor Ivan Okhlobystin called the police “idiots” on Twitter, while many bloggers wondered why the incident couldn’t have been sorted out locally, so that the pensioner wouldn’t have had to experience public humiliation. Others wondered why no one offered to step up and pay the trivial sum. With the situation threatening to turn into a PR disaster for Magnit, chief executive and owner Sergey Galitskiy tweeted that it was “a mistake” to involve uniformed officers, opening himself up to questions on what the company policy on theft is, and how to avoid similar situations. Public organization Consumers Union of St. Petersburg regularly receives complaints about the lack of respect for pensioners by staff of retail chains, including refusal to let older people shop in stores, union's chairman Eugene Sadovsky told RIA Novosti. "Employees of the store committed a vile act against a pensioner, who is a survivor of WWII’s Leningrad siege, to boot. An elderly woman could really forget to pay for the butter due to memory problems," he added. Some of the anger has been re-directed at the police. Investigators are to determine whether the store employees acted within the law and whether they had "any reason to suspect the woman - who survived the Siege of Leningrad - of the theft of three packs of butter and to call the police," spokesman for the Russian Investigative Committee, Vladimir Markin, said. Investigators are also to establish whether it was necessary to take the woman to the police station instead of resolving the situation on the spot.